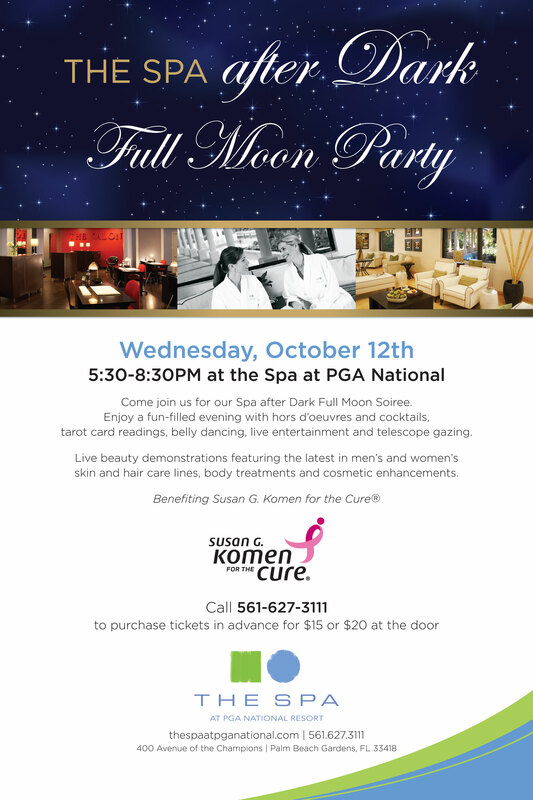 On Wednesday, October 9th, 2013, the Spa at PGA National will host its Spa after Dark event, after hours from 5:30pm to 8:30pm. 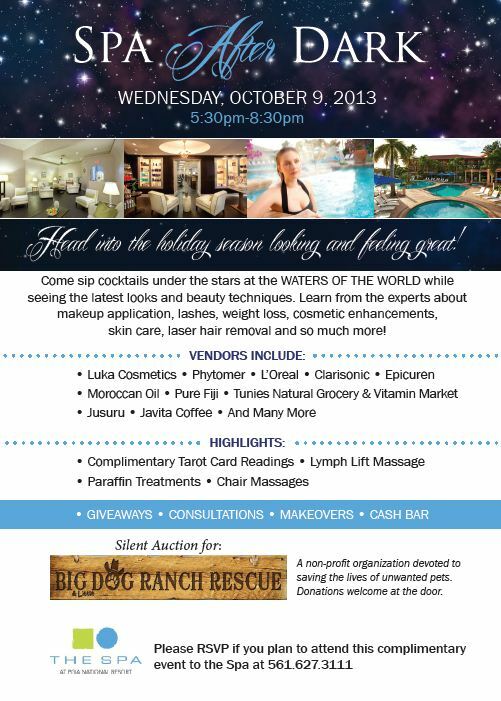 This cocktail party under the stars by the famed Waters of the Worlds outdoor healing mineral pools, will allow locals, members and resort guests to learn the latest in beauty techniques, spa trends, shop to their hearts content and meet the beauty experts behind the scenes at the Spa. That evening the Spa at PGA National will unveil their all new Hydrafacial System. The HydraFacial™ is a non-invasive, non-surgical procedure that delivers instant results with no discomfort or downtime. The procedure is immediately effective. A silent auction and donations will be collected and appreciated at the door to benefit Big Dog Ranch Rescue. Big Dog Ranch Rescue is a 501(c)3 non-profit organization devoted to saving the lives of unwanted pets. Out of Wellington, they provide great care for dogs, of all breeds, until they are adopted to the right homes. Participating beauty vendors include Loreal, Pure Fiji, MoroccanOil, Epicuren, Tunies Groceries, Luka Cosmetics, Javita Coffee, Jusuru, and Clarisonic. RSVP to attend required by calling 561.627.3111. The Spa at PGA National’s outdoor Waters of the World Cafe recently launched their new spa cuisine menu featuring light fare, smoothies, wrap sandwiches, cold soups and fresh salads. Chef Dan Handy from the Spa at PGA National’s Waters of the World Café has shared an appetizing and easy Mexican Shrimp Martini recipe to make at home. 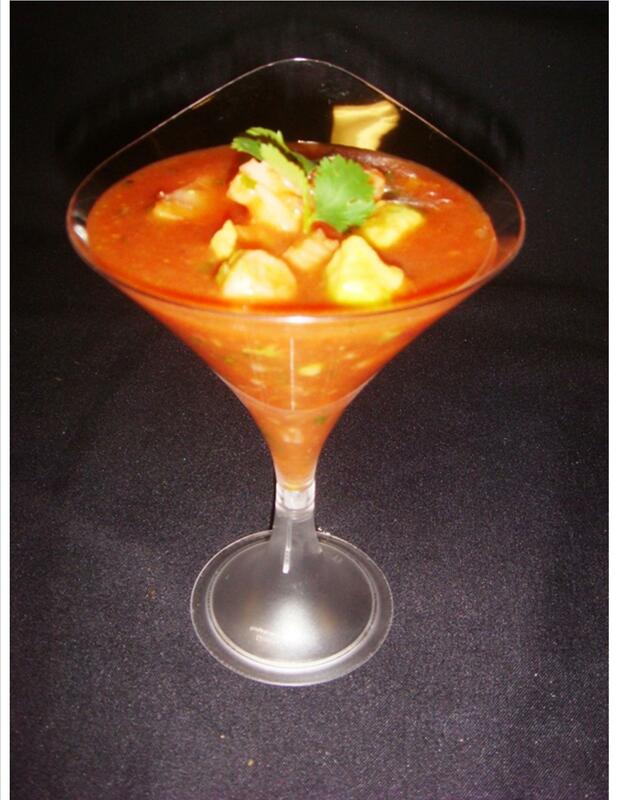 This healthy spa recipe is low in fat, filling, and is a zesty twist on the average refreshingly cold tomato-based soup, otherwise known as Gazpacho. It is the perfect starter for a hot day of relaxation by the Waters of the Worlds pools or makes a great meal at home served with a nicely warmed baguette. Cover, and refrigerate 2 to 3 hours. Tip: Top with a dollop of sour cream or garnish with a sprig of fresh cilantro for an added personal touch. The Waters of the World Cafe is poolside at the Spa at PGA National. 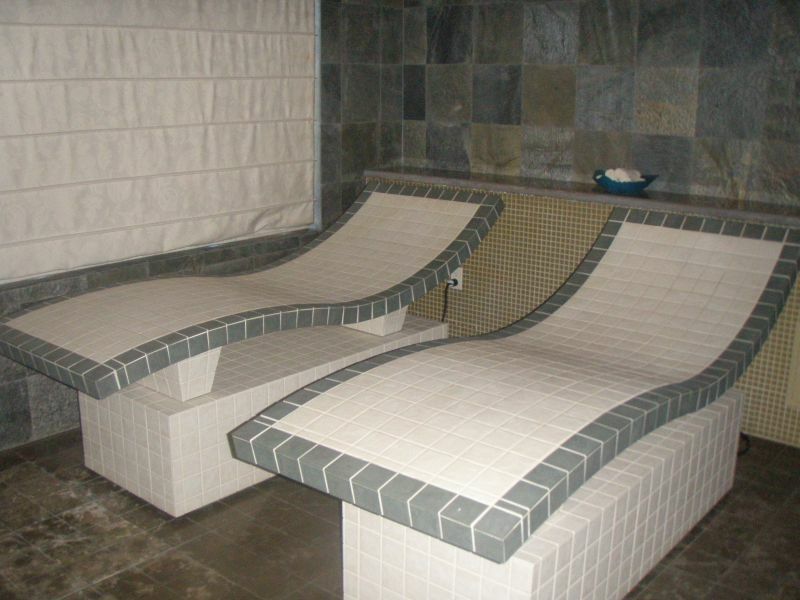 It is private to guests of the Spa only. 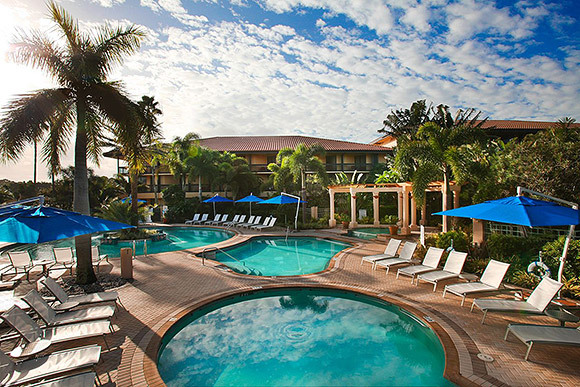 Located at 400 Avenue of the Champions adjacent to the PGA National Resort in Palm Beach Gardens, it is a great place to enjoy light, spa cuisine while lounging by the Waters of the World healing mineral pools. On Wednesday, October 12th, 2011 from 5:30 pm to 8:30 pm, locals are invited to The Spa After Dark Moonlight Soiree at The Spa at PGA National. Enjoy a fun filled evening with tarot card readings, belly dancing, live entertainment and telescope gazing. Live beauty demonstrations featuring the latest in men’s and women’s skin and hair care lines, body treatments, and cosmetic enhancements. Palm Beach Plastic and Cosmetic Surgeon, Dr. Frederic M.Barr will be present to answer any questions in regards to the varied medical spa services he now offers weekly at the Spa at reasonable prices. Don’t miss out on getting a chance to see the outdoor area where the one of a kind Waters of the Worlds mineral pools are located. Wine, beer and full liquor service will be available and servers will walk around the Waters of the World outdoor area with delicious Greek specialty food offerings. A silent auction along with a portion of tickets sales will benefit the South Florida Affiliate of Susan G. Komen for the Cure®. And the retail boutique will offer a generous 10% discount to all guests for that night only. No dinner plans for that evening? 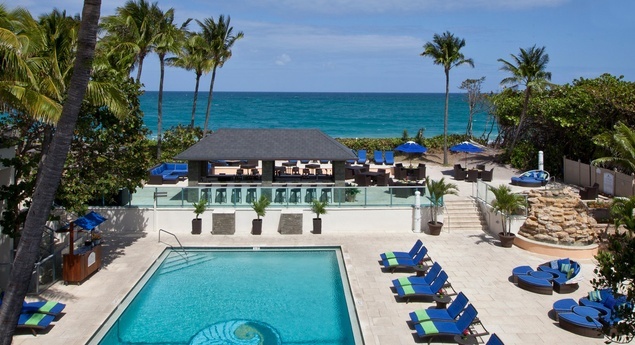 Consider light fare at the resort’s iBAR which offers specialities like Snapper Ceviche, appe-tini and or Chicken Parmesan Sandwiches and Crabcake Sandwiches. Or enjoy a full dinner at Ironwood Grille. On Wednesday, July 20th about 200 locals including my husband and me enjoyed a fun filled event at The Spa at PGA National. Attendees enjoyed a Latin-themed event that featured multiple beauty demonstrations, live entertainment, refreshments and several vendors showing off their retail products lines all carried at The Spa. My husband and I gained some great insight on fillers like Botox and Juvederm in a conversation with Palm Beach Plastic and Cosmetic Surgeon, Dr. Frederic M.Barr. Dr Barr demonstrated on an actual patient how the Juvederm fillers can benefit clients. Results were apparent immediately, as his patient received injections in her eye and lip area. Dr. Barr happily answered all our questions in regards to Botox and went into great detail of its safety and benefits. Dr. Barr now offers his medical spa services weekly at the Spa at PGA National at reasonable prices. the night away while we watched and enjoyed the beat of music with a Latin flair. Indoors, we had a chance to be educated on several product lines like Moroccan Oil, Epicuren, Phytomer and Clarisonic. I watched as a Jane Iredale Make up Artist gave a guest a complimentary makeovers. Representatives from several upscale beauty products not only answered questions but allowed me and other guests to try products. 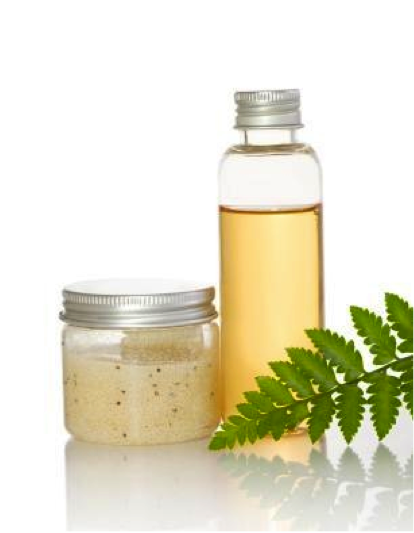 I personally have never gotten a chance to sample some of the products like Epicuren, a pure skin care line using only luxurious natural ingredients. Multiple open bars featured Blue Hawaiian cocktails, wine, beer and full liquor service while servers walked around the Waters of the World outdoor area with delicious food offerings. Menu items included Latin favorites, ceviche, empanadas, mini Cuban sandwiches and papa rellenas. a generous 10% discount to all guests for that night only. After we enjoyed a couple hours at the event we topped the night off with an enjoyable dining experience at i-bar. 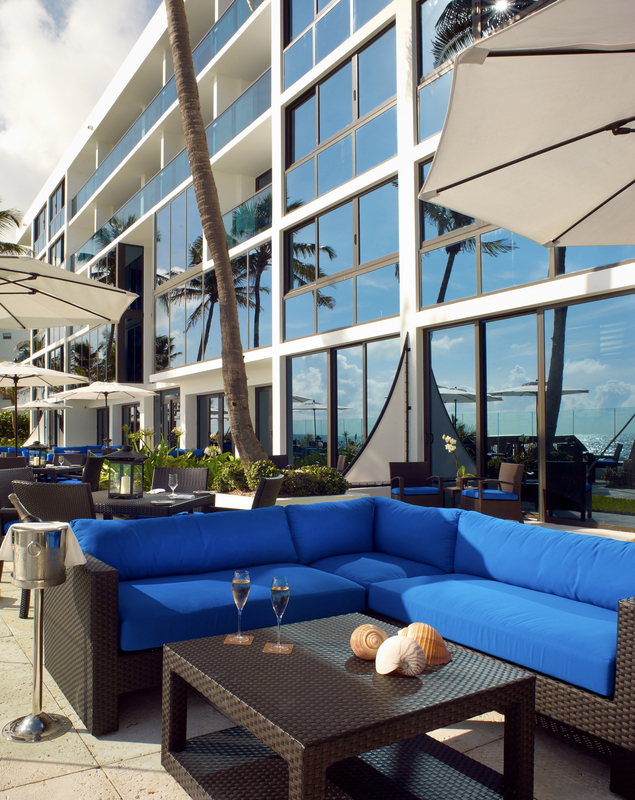 The resort’s lobby bar and lounge area offers a full menu. We had a chance to enjoy a scrumptious dinner there. We tried the Snapper Ceviche, appe-tini and for our main course, Chicken Parmesan Sandwiches and Crabcake Sandwiches which were both delicious. 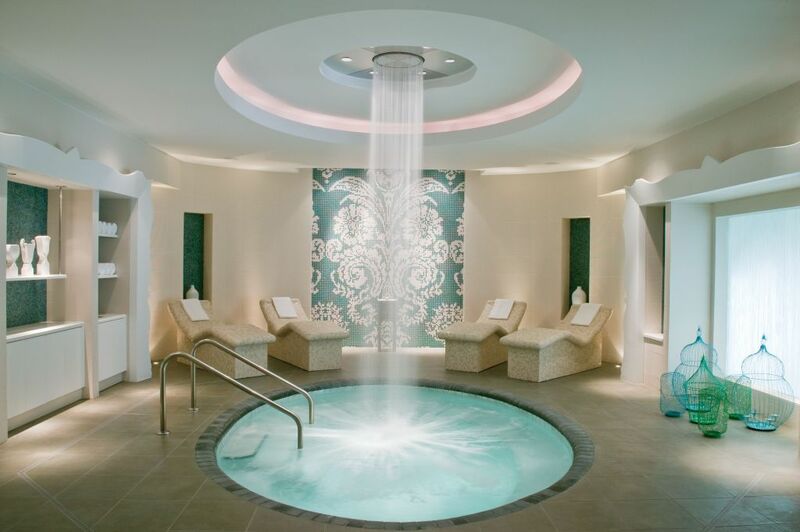 If you missed out on this exciting event don’t forget The Spa at PGA National offers the Waters of the World pools which is an exclusive spa amenity available only at this local spa. Be sure to visit The Spa website for more information.